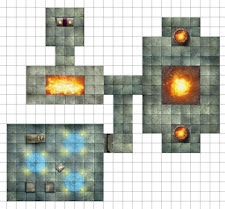 Creating and sharing dungeon maps online has become even easier. Check out the following example. You've probably seen our Dungeon Tiles previews in our monthly "Previews" article series and may even have scored a copy of these cool tiles. By now you probably have hundreds of cool dungeon designs running around your head. But how can you create these dungeons and share them with your friends? They are hosting the Dungeon Tile Tool, created by a fan of the game. There is an online version, or a version you can download to your local machine. Try it out for yourself at Wizards.com.